Even though we’re at winter’s peak, concert season isn’t too far away. So many concertgoers associate summer nights with pulsating shows and the memories made with them. Even lukewarm attendees feel nostalgic for the warm breeze of summer nights and the heart-warming memories of yesterday’s concerts. Aside from the venue’s growing pains, Mercedes-Benz Stadium is pulling in heavy hitters to headline the local state-of-the-art facility, pulling business away from established and emerging venues. To stand out in a competitive market, exterior building signage will help your concert venue. Whether you’re booking up-and-coming local musicians or world-renowned bands, your venue will fly under the radar sans exterior building signage. Observing the examples of Do-Wrong and Do-Right, let’s take a look at a few best signage types and practices. Our friend, Do-Wrong, is the epitome of what not to do with signage (bless his heart), and Do-Right’s examples will teach us the right way to go about it. Do-Wrong would place the sign on a discrete location on the building that’s prone to damage. In fact, his sign would be within striking distance of a dying tree. That’s not a wise idea. Do-Right would place his building signage in an area completely visible and noticeable from an area with a high volume of traffic. Do-Right’s signage would not blend in with its surrounds and would be in an attention-grabbing spot such as above the main door. A cabinet sign would do the trick for Do-Right’s needs. Do-Wrong wants to put “Hear Music Here” on his concert venue sign. Needless to say, that one needs some work. Do-Right is conjuring up the clearest and most effective message to put on his sign. His goal is to come up with a message that will resonate with his audience. The sign Do-Right has in mind will conform to and be consistent with his venue’s branding. He’s considering a channel letter sign for the clearest, most straight-to-the-point option. Do-Wrong is adamant his neon open sign will suffice for his concert venue. Good luck with that. Do-Right is looking into an electronic message center to showcase his venue’s upcoming concerts. Seems like Do-Right knows how to grab the attention and pique the interest of his audience. Always know the local zoning regulations before brainstorming which sign would work for you. 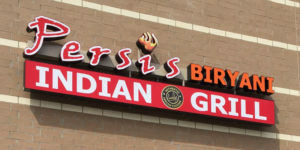 Also, call Apex Signs & Graphics for your exterior building signage needs. If you’re looking for success, don’t follow the footsteps of our friend, Do-Wrong. The pros at Apex Signs & Graphics endorse Do-Right’s on-point advice. To get started on your exterior business signage, contact us today at 678-795-0775 or request a quote. Don’t forget to connect with us on Facebook, Twitter, and LinkedIn.